We are grateful to God that the numbers of people coming into our church have greatly improved. We are visited by two or three new people from our compound every Sunday. We are busy running membership and baptism classes. There are two in the membership class for those already baptized. Among the nine preparing for baptism we have three from one family, a mother and her two children, Mutinta and Esther. These three are part of the family that we have received into our church from Jehovah’s Witness some two months ago. Ever since they started attending I have been visiting them closely and they have become part of us. They are professing Christ as Saviour and Lord. I ask you to join hands to pray for Esther who is their firstborn. She is married with two beautiful daughters but the husband is becoming a thorn in her flesh. He at times denies her the chance to come to church. Pray that her husband may see Christ and hear His voice soon. The women in our church have opened up a tailoring class. They want to learn sewing skills to generate income to support their families and contribute to the ministry of the church. My wife Stella has volunteered to teach freely both women from our church and outsiders, so that through this class some may also hear the voice of God and come to Christ. Pray for her that God may grant her strength and wisdom in this ministry. Our church has this year been very busy with building infrastructure. I mentioned the construction of new classrooms for our school in an earlier post. With the help of generous partners, we were also able to drill a well on our church property. This has helped us gain recognition as Reformed Baptists, and people now in the community have accepted us as a holistic-care, gospel-preaching church. 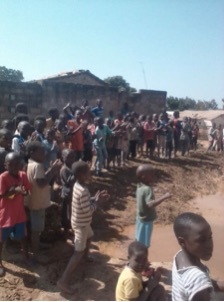 You can see in the picture (left) children from the community applauding the completion of drilling the well. One little girl (right) actually demonstrated her faith by coming with a cup! 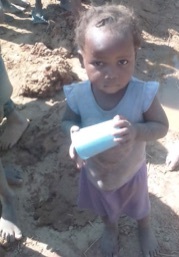 She was told that they were going to have water to drink after a few minutes.